Muktar Kedir, Oromo People’s Democratic Organization (OPDO) chairman and president of Oromia regional state of Ethiopia resigned from party charimanship- reported Fana Broadcasting. Oromo People’s Democratic Organization is member of the ruling coalition Ethiopian Peopole’s Revolutionary Democratic Front (EPRDF). Aster Mamo, who is one of the three deputy prime ministers to Hailemariam Desalegne, also resigned from her position within OPDO. Fana report is not explicit if her resignation from her party position entails resignation from her position at the Federal government level. According to Fana Broadcasting report, their resignation came after what it described as week long party evaluation along what the ruling party refers to “tilq tehadso” ( translates to in-depth party renewal- elites actually meant to employ a term that historians used to describe medieval era phenomena in Europe – renaissance). Much is not known if the resignation is a response to pressure from within (OPDO) and outside of party. TPLF is believed to use OPDO as one of its cliques within the coalition and any changes without its will could even be impossible, as many observers with insider information believe. Lema Megersa and Worqeneh Gebeyehu are reportedly “elected” Chairman and vice-chairman of OPDO respectively. While OPDO represents nearly one-third of Ethiopian population, it has been criticized by opposition in the country and abroad for being a tool for the chauvinism and supremacy of Tigray People’s Liberation Front. 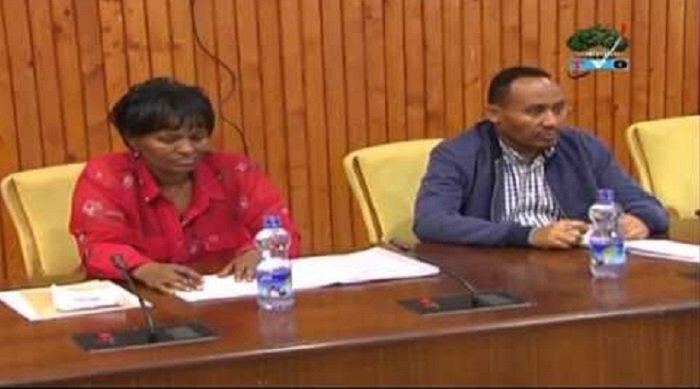 Other member organizations of the ruling coalitions including Amhara National Democtatic Movement (ANDM) and Southern People’s Democratic Organizations are also undertaking evaluation for an “in-depth party renewal.” However, the result of which is not yet known. Yet, purger and even arrest is expected at the end of the evaluation. Ethiopia has been under intense popular revolt in opposition of TPLF rule. Remains to be seen if the “changes” could bring about change that could consolidates TPLF power. Thousands of civilians were brutally killed in Amhara, Oromo and Konso regions of Ethiopia after the prime minister deployed armed forces to quell down peaceful protest by force. Join the conversation. Share your thoughts. Follow us on Twitter . Like us on Facebook And please share. 2 Responses to "Ethiopia : Deputy Prime Minister Aster Mamo and Oromia region president Muktar Kedir Resigned"
it is a good start but still need further actions. I hope this will pass a message to other sister organisation of EPRDF.